Back in 2005, an under-the-radar folksy act called Iron & Wine took an even smaller Seattle band called Band of Horses on tour across America. 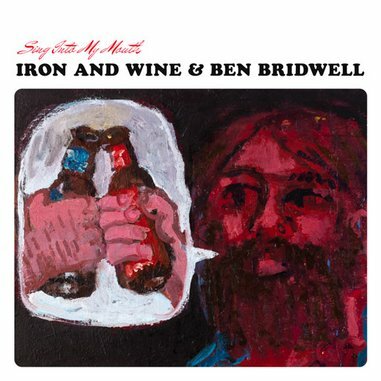 It all stemmed from the fact that Iron & Wine’s main man Sam Beam grew up with Band of Horses singer/songwriter Ben Bridwell’s older brother in Columbia, S.C. The two musicians have since fostered a long friendship, most recently culminating in the covers album Sing Into My Mouth. But in a year full of big cover songs and LPs, Sing Into My Mouth seems more akin to Seth Avett & Jessica Lea Mayfield Sing Elliott Smith rather than Ben Folds’ snarky covers of pop radio tunes or the A.V. Club’s magnificent Undercover series. The two friends pay loving homage to 12 artists who have affected both of their careers. It’s a passion project, for sure, but one that exudes the geeky music-lover joy of discovering a new song or band for the first time. Recorded last summer at Echo Mountain Studios in Asheville, N.C., Beam and Bridwell alternate singing lead on these 12 cover songs. The title of Sing Into My Mouth comes from a lyric from Talking Heads’ “This Must Be the Place (Naive Melody),” the opening track of the LP. As A-list indie-folk bands in the 21st century, both Iron & Wine and Band of Horses are most defined by their vocalists. But Beam and Bridwell only share lead vocal duties on a few songs like “This Must Be the Place (Naive Melody)” and strong harmonies on songs like the Marshall Tucker Band’s “Ab’s Song.” So when each singer takes the vocal spotlight alone, it diminishes the effect of the overall collaborative effort. Regardless, the love and care for each of these songs is readily apparent for Beam and Bridwell. While Sing Into My Mouth won’t likely make essential discography lists for either artists, this collaboration is an absolutely enjoyable and exciting listen full of new discoveries for fans of either band.